This study aims to investigate the biometric effects of weightlifting on antebrachium. Study group was composed of 9 adult male weightlifters and 9 sedentary male individuals between the ages of 20-25. Body weight and height of participants were measured. Left arm radius distal terminus bone mineral density (BMD) was measured via dual-energy x-ray absorptiometry (DEXA) method and recorded as gr/cm2. Two dimensional (2D) images of right and left antebrachium bones were obtained through multi detector computed tomography (MDCT). 2D images were converted to 3D images with the help of Mimics-13.1 software program and bone volume, length and thickness were measured with the same programme. Weightlifters’ radius distal terminus bone mineral density (BMD) was recorded to be higher compared to data obtained from sedentary individuals. Taken as a whole, results of this study presented high values in weightlifters’ ossa antebrachii mass. This magnitude was identified to be in bone width instead of bone length and distributed in the periosteal direction. High values in the radius and ulna bone volumes, radius cortex thickness and BMD values of the radius distal terminus can be regarded as indicators of bone quality and strength. Existence of numerical value differences especially in sedentary individuals in the comparison of data for right forearm and left forearm mass may be related to the fact that right hand is more dominant in daily life and effects of working with heavy loads may decrease this effect in weightlifters. Akman, S.D., Karakaş, P.Y. & Bozkır, M.G. (2006). The morphometric measurements of humerus segments. Turkish Journal of Medical Sciences, 36, 81-85. Allori, A.C., Sailon, A.M. & Warren, S.M. (2008). Biological basis of bone formation, remodeling, and repair- part 1: Biochemical signaling molecules. Tissue Engineering Part B, 14(3), 259-273. Duncan, C.S., Blimkie, C.J., Kemp, A., Higgs, W., Cowell, C.T., Woodhead, H., Briody, J.N. & Howman-Giles, R. (2002). Mid-femur geometry and biomechanical properties in 15 to 18 year old female athletes. Medicine & Science in Sports & Exercise, 34, 673-681. Duquet, W. & Carter, J.E.L. (1999). Somatotyping. In: Eston R, Reilly T, Ed. Kinantropometry and exercise physiyology laboratory manuel. 3rd edition. New York: Routledge, 54-69. Eren, O.T., Kucukkaya, M., Balci, V., Kabukcuoglu, Y. & Kuzgun, U (2003) Bone mineral density in patıents with distal radial fractures. Journal of Arthroplasty and Arthroscopic Surgery, 14,158-163. Haapasalo, H., Kontulainen, S., Sieva, H., Kannus, P., Rvinen, M.J. & Vuori, I. (2000). Exercise-induced bone gain is due to enlargement in bone size without a change in volumetric bone density: a peripheral quantitative computed tomography study of the upper arms of male tennis players. Bone, 27(3), 351- 357. Heinonen, A., Oja, P., Kannus, P., Sievanen, S., Manttari, A. & Vuori, I. (1993). Bone mineral density of female athletes in different sports. Article Bone and Mineral, 23(1), 1-14. Hu, H., He, H.D., Foley, W.D. & Fox, S.H. (2000). Four multidetector-row helical CT: Image quality and volume coverage speed. Radiology, 215(1), 55-62. Joo, Y.I., Sone, T., Fukunaga, M., Lim, S.G. & Onodera, S. (2003). Effects of endurance exercise on three- dimensional trabecular bone microarchitecture in young growing rats. Bone, 33(4), 485-93. Judex, S., Rubin, J. & Rubin, C. (2008). Mechanisms of exercise effects on bone quantity and quality. In: Principles of bone biology. Bilezikian, J.P., Raisz, L.G., Martin, J. (eds.) 3rd edition, San Diego, CA: Academic Press, 1819-34. Kalayci, İ. (2008). 3D Reconstruction of phalangeal and metacarpal bones of male judo players and sedentary men by MDCT images. Journal of Sports Science and Medicine,7,544-8. Karlsson, M.K. and Rosengren, B.E. (2012). Training and bone - from health to injury. Scandinavian Journal of Medicine and Science in Sports, doi: 10.1111/j.1600-0838.2012.01461.x. Krupa, P., Krsek, P., Cernochova, P. and Molitor, M. (2004). 3D real modelling and CT biomodels application in facial surgery. In: Neuroradiology, XXIX Congress of the European Society of Neuroradiology, Berlin, p. 1, ISBN 0028-3940. Lapauw, B., Taes, Y., Simoens, S., Caenegem, E.V., Weyers, S., Goemaere, S., Toye, K., Kaufman, J.M. & Tsjoen, G.G. (2008). Body composition, volumetric and areal bone parameters in male-to- femaletranssexual persons. Bone, 43, 1016-21. Materialise (2012). http://biomedical.materi-alise.com/mimicsMimics Date of access: 06/12/2012. Poeschl, P.W., Schmidt, N., Guevara-Rojas, G.,Seemann, R., Ewers, R., Zipko, H.T. & Schicho K. (2013). Comparison of cone-beam and conventional multislice computed tomography for image-guided dental implant planning. Clin Oral Invest, 17, 317-24. Stewart, K.J., Bacher, A.C., Hees, P.S., Tayback, M., Ouyang, P. & Beur, S.J. (2005). Exercise effects on bone mineral density relationships to changes in fitness and fatness. American Journal of Preventive Medicine, 28, 459. Wohl, G.R., Boyd, S.K., Judex, S. & Zernicke, R.F. (2000). Functional adaptation of bone to exercise and injury. Journal of Science and Medicine in Sport, 3(3), 313-24. Yıldız, M.E. & Beşoluk, K. (2013). Comparison the volume of the carpal bones among adult male weightlifters and sedantery subjects. SSTB International Refereed Academic Journal of Sports, 08 (3), 68-76. Yıldız, M.E. & Beşoluk, K. (2014). Investigating the effect of weightlifting on the metacarpal bones’ measurement parameters by using 3D modeling technique. In: 2nd International Physical Education and Sports Congress for the Disabled, Batman, Turkey, p 104. ISNAD Yıldız, Mehmet , Beşoluk, Kamil . "COMPARISON OF BIOMETRIC MEASUREMENT VALUES OF OSSA ANTEBRACHII IN WEIGHTLIFTERS AND SEDENTARY INDIVIDUALS". 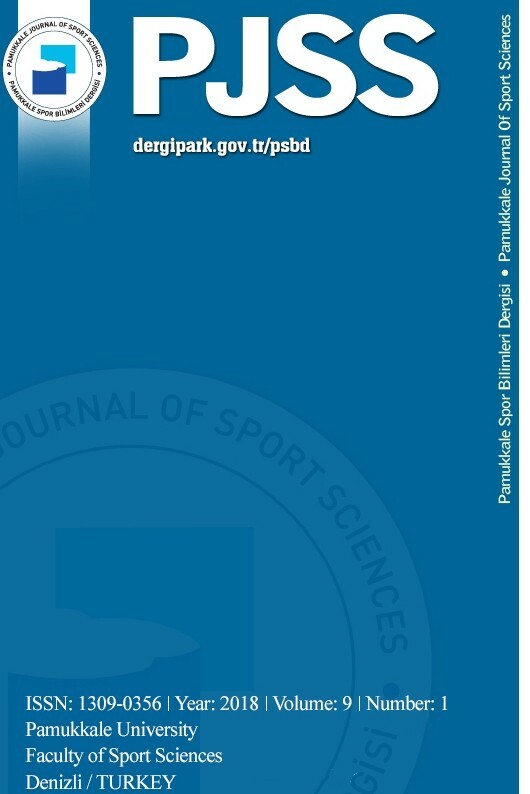 Pamukkale Journal of Sport Sciences 7 / 1 (January 2016): 1-11.